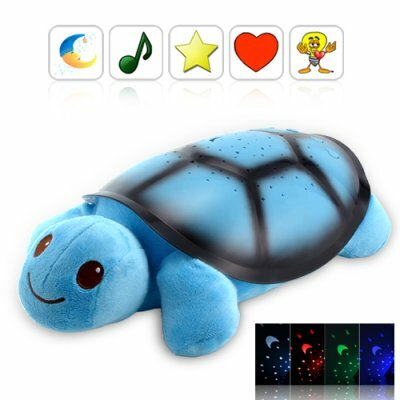 Successfully Added Teddy The Turtle Stuffed Toy (Melody Player + Night Light) to your Shopping Cart. Teddy The Turtle - adorable and PRACTICAL! (How often can you say that about a toy!). With its sweet and gentle melody player, your child will fall fast asleep to soothing lullabies. What's more, Teddy The Turtle will keep them company during the night with its night light star projector so they won't have to be afraid of the dark anymore! Perfectly Huggable Teddy The Turtle is so much better than your average stuffed toy! It's an allergy-free plush toy that's cuddly and totally huggable. And because of its neutral baby blue color, it's perfect for BOTH boys and girls. Teddy The Turtle always smiles and is ready to keep your child company both night or day. It's got four big heart buttons on its turtle shell which control different pattern lights and melodies. Lullaby Baby! When your child presses on the heart button labeled L3, they can scroll to and fall asleep to one of four sweet lullabies! The melodies are especially soothing to be relaxing and comforting to the mind so they'll fall gently into a deep sleep and be refreshed for kindergarten class tomorrow. In fact, when you see how well it works you might just be tempted to get a Teddy The Turtle for yourself! Star Light, Star Bright! Teddy The Turtle also comes with a star projector that's a great night light. Perfect for little kids who are shy about the dark, Teddy The Turtle casts a comforting light display on the ceiling - stars, moons, and hearts so they'll always be happy and full of calm as they drift off into the land of pleasant dreams. The heart button L2 activates a static light display, but when your child presses on heart button L2, they can activate a color-changing night sky to fall asleep to. Perfect for small children or the child inside you, click "Add to Cart" now. This item is sure to be a great resell item as we expect Teddy The Turtle to be the next big toy wonder! Brought to you by the online China wholesale dropship leaders - Chinavasion! I know this adorable toy is for children, but I'm 32 and work really stresses me out. I'm a project manager at a leading software firm and I sleep lousy at night because of all the work-related pressures. Do you think Teddy The Turtle can help me? We're pretty confident that you'll be sleeping like a baby once you get your hands on Teddy The Turtle. Picture this: the room is cool and quiet. There's a light display of hearts, moons, and stars on your ceiling. A gentle lullaby is playing next to you inviting you to just relax and let go. Soon you fall into the best sleep you've had in your life and soon, you'll get a promotion at work because you're so productive. Hey I've seen this online selling for 2 dollars less, what's up with that?! This is the best price on the Internet. What you've seen is actually the small version for this item. This is the large version of Teddy The Turtle.